Last year, Lenovo launched a smartphone Lenovo A536 at very affordable price. Lenovo A536 comes in two color variety Black and White. Customer can buy Lenovo A536 at cheapest online price from various online retail sites by comparing its price. This dual-sim phone runs on Android Kitkat 4.4.2. The Lenovo A536 comes with 5 inch capacitive touch screen with 480x854 resolution. The Lenovo A536 specification also includes 1.3 GHz cortex-A7 quad core processor with 1 GB RAM, so you can run various apps without any lag. Lenovo A536 price in India is around 7 – 8K. Buy online Lenovo A536 that has 2 MP front camera and 5 MP rear camera with auto focus and LED flash. This 2 MP front camera is a good news for selfie lovers, who can take good quality selfies. Other camera features include HDR mode, multi angle view, face detection, auto scene detection, continuous shots and scene mode. Buy Lenovo A536 online that comes with 8 GB internal storage which can be extended up to 32 GB using micro SD card, which means customer can store large numbers of pictures and videos on the phone. Features of Lenovo A536 also includes Wifi which allows you to connect to wireless internet network. File can be transferred through Bluetooth v4.0 present in the phone. 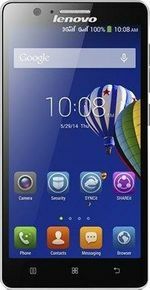 Other specifications of Lenovo A536 includes accelerometer and proximity sensors, GPS which can be used for navigation purpose and FM radio to tune into your favorite radio station to listen to music. Lenovo A536 smartphone also includes 2000 mAh Li-polymer battery with standby up to 300 hour and talk time upto 15 hour and 30 minutes on 2G and 12 hours on 3G so you can work on the smartphone without worrying about charging phones again and again. Lenovo A536 with these specifications gives tough competition to various other phones at this price range. I'm using this phn since 1 year and happy with its performance.. No hanging no lagging everything is good rear camera awsm front cam is not good.. It supports heavy games easily a bit heating while running heavy games but that's ok.